The actor Sanjô Namie I held this name from the 5th lunar month of 1745 to the end of the Meiwa era. Born in 1757. Disciple of Arashi Sangorô II, he started his career in hama shibai, performing under the name of Arashi Wakamatsu I as a wakaonnagata actor. Getting older, he switched to kashagata roles. He took the name of Sanjô Namie II in the 11th lunar month of 1808, in Ôsaka at the Naka no Shibai, where he played the role of the tsubone Miyuki in the kaomise drama "Shima Meguri Tsuki no Yumihari". 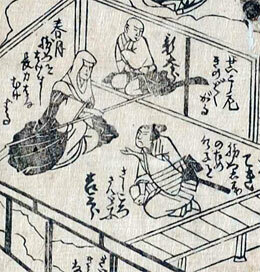 He went to Edo in winter 1810, in the company of the actors Ichikawa Ichizô I, Asao Yûjirô I, Ôtani Monzô I, Kanô San'emon II, Yamamura Giemon III, Fujikawa Tomosaburô, Ichikawa Tsurusaburô I and Bandô Nariemon. He performed in the 1st lunar month of 1810 at the Moritaza two roles in the drama "Hachijin Shugo no Honjô". He went back to Ôsaka in the 9th lunar month of 1811 where he was active up to his sudden death the 15th of the 9th lunar month of 1814, on the stage of the Kado no Shibai. He excelled in karô's wives roles. Dates of birth and death unknown. Son or adopted son of Sanjô Namie II, his first stage name was Arashi Wakamatsu II. 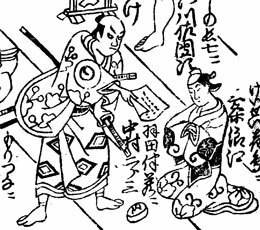 He took the name of Sanjô Namie III in 1831. He made an obscure career in Kamigata.